For years I’ve been making dolls out of Acrylic yarn and I’m sure many of us have. Doll and toy making was traditionally done using the scraps and left over yarns we had left over from our precious makes. It made sense to use cheap yarn for a doll. Last year I began experimenting with wool for doll making, then with my final uni project I decided to make these dolls using only natural materials. 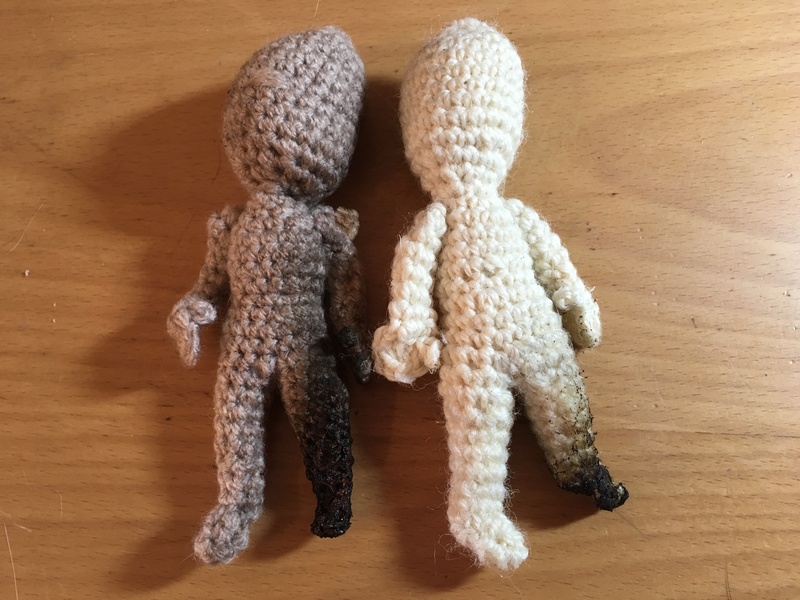 There was one test I wanted to do to compare Acrylic to Wool, but it meant making and destroying two dolls, plus although in theory I knew what they said about the results I wasn’t sure. Today I did the test… I’m shocked! Natural. Wool is completely natural, sheep eats grass – sheep grows wool – sheep is warm in winter – we cut wool – sheep feels cool in Summer – we use wool – sheep eats grass – and so on and so on. No chemists or scientists involved. Biodegradable. Prince Charles did a similar experiment to mine, but he also tested how quickly wool would disappear back into the earth. He buried two jumpers, one wool, one synthetic. Six months later he dug them up. The synthetic jumper was intact, but the wool jumper had disappeared. In this plastic heavy world, this should be reason enough. Renewable. Like being a natural source, wool is also renewable. The sheep doesn’t just have one coat, but a continuously growing fleece. Breathable. Wool wicks moisture away from the skin making your body less clammy. Ok, so it might not make that much difference to doll making, unless you’re a little kid who takes the doll to bed with them. Nothing worse than waking up with sweat sticking a doll to your face. Keeps you warm… or cool. Wool keeps you warm when you’re cold and cools you when you’re too hot. Again, a nicer toy to hug at night than a plastic doll. Machine Washable. Yep, the yarn I use in my dolls is treated to be machine washable. Stain resistant. It has an outer layer that prevents stains from being absorbed and it’s anti-static properties mean a lot of dust and dirt simply don’t stick to it. Odour resistant. When it wicks away sweat, it also absorbs the molecules of odour. Better sleep. New research has shown sleeping with wool bedding or nightwear leads to a better nights sleep. Another reason to take the doll to bed with you. Healthy skin. Again, research is coming out that shows the benefits of softer wools on skin. Finally, wool is flame resistant. What does that mean? One important message to come from my final project is the importance of making dolls and toys out of wool, but as I researched a wool to use I found little on offer. Ok, you can buy browns and pinks and mustards, but skin tones are not really covered by wool suppliers. That’s one thing I’ve been looking at with my dolls and what to do after university, perhaps I could produce 100% British wool in skin tones for doll making, the video has shocked me enough to realise it’s got to be done.